In an absolute thriller contest, the table toppers Minerva Punjab and East Bengal shared the spoils today in the I-League roundup. The game ended in an entertaining 2-2 draw as East Bengal Bottled their opportunity to close the gap on the league leaders. Let’s take a look at some of the talking points from the match. What next for Khalid Jamil? Khalid Jamil is well respected name in Indian football. The former Indian football player is one of the youngest Indian coaches going around and is also the most paid. 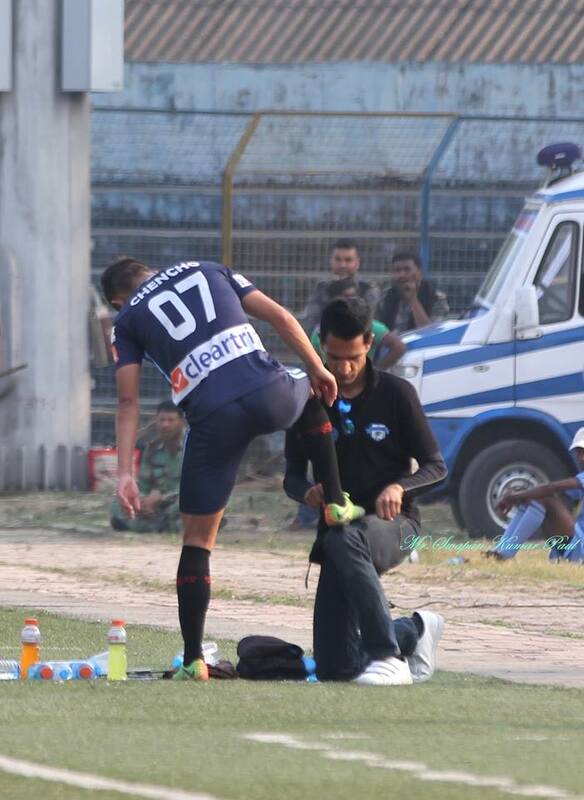 After his championship winning stint with Aizawl FC, great many things were expected from him. A derby loss was already hurting the fans and Khalid was involved in a row after abusing the media. He is sure feeling the pressure. His team salvaged a point after a good second half but it clearly looks like a point won’t be enough for their title hopes or for their fans. He is surely feeling the heat and things are getting trickier for the highest paid Indian coach in the history. The league leaders were up and running in the first half as they went two goals up around the half an hour mark. Despite not having the ball for most of the first half, Minerva took their opportunities well and was worthy leaders going into the break. In the second half they were made to toil hard. They resorted to defending their lead by shutting down shop but the plan backfired for the visitors. They conceded very late in the game and it will definitely hurt Khogen’s men. Though it is a difficult task to play two very difficult away games in the space of four days, Minerva will be kicking themselves for dropping two points after getting their noses ahead in the first half. The side from Punjab are still in pole position to wrap up their maiden I-League title but their fans and Khogen will be hoping his side will be ruthless in upcoming games to wrap up the title soon. East Bengal and I league, never to be? East Bengal have never won the I-League since its inception in 2007-08. Their last league championship in Indian top tier was over 14 years ago. Khalid was brought on for a record breaking deal. The Indian gaffer signed some exciting stars and their fans were pumped up for this season. Already trailing Minerva by 6 points with a game in hand this game was a must win for them. Khalid Jamil threw the kitchen sink at it as he had three strikers in the 11 at one point in the game yet they could only salvage only a single point from the game. It is almost as if this is just not meant to be. Katsumi missed a penalty in the 50th minute which could have sparked the comeback a lot earlier and they hit the upright in injury time. One of the most loved club in the country, it is a shame that their trophy drought has lasted this long. With the talks of merger on the horizon, East Bengal may have just bottled their last chance at the rebranded I-League. It is hard not to expect a close title race for the neutrals. While Minerva fans will disagree, they along with the entire Indian football fans will be closely watching Neroca’s match against Churchill brothers tonight. Neroca are five points behind the leaders having played a game more and the side from Manipur can cut the gap to two points. Though Minerva Punjab will have two games in hand to extend their lead, points in the bag is always better than games at hand. Can Neroca push Minerva till the final round, or even emerge the champions? Nobody would have predicted this at the start of the league but the I-League continues to dish out exhilarating stories.